Yamato-no-Kami Yasusada (大和守安定) has long been thought to have moved to Edo from Echizen Province having been a student of the Shodai Yasutsugu (初代康継). Another school of thought has been that he came to Edo from the Kishu Ishido (紀州石堂) group. While the former was the predominate thinking for quite awhile, a discovery of a sword signed by him dated in the tenth year of Kanbun (1670) and which stated to have been made when he was fifty-three years of age has shifted the thinking to the latter idea that he was originally from the Kishu Ishido group (紀州石堂). That information allows us to deduce that if he was 53 years old in Kanbun 10 (1670), he was born around Genwa 4 (1618). Since the Shodai Yasutsugu (初代康継) died in Genwa 7 (1621), this would make Yasusada (安定) only three to four years old at the time of Yasutsugu’s (康継) death. 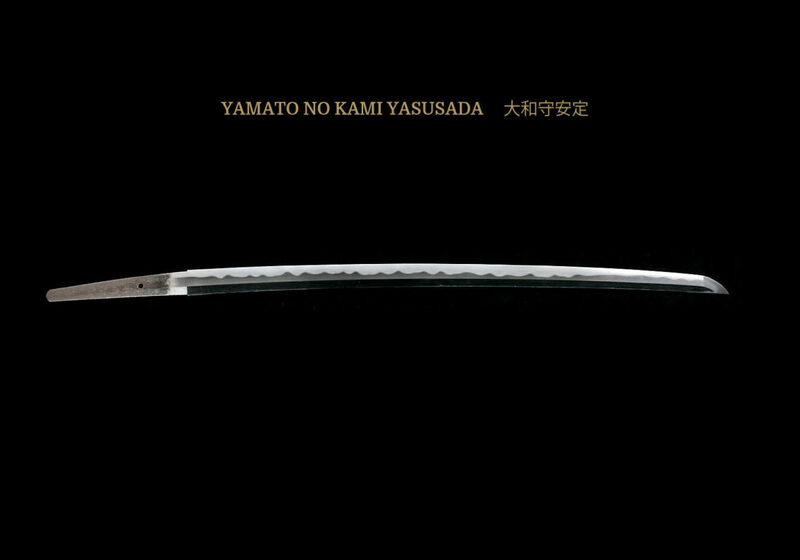 The presence of a wakizashi inscribed Kishu Wakayama (no) Jyu Yasuhiro Tsukuru Yamato-Daijo Yasusada Saku (紀州和歌山住安廣造 大和大掾安定作) is further evidence of Yasusada’s (安定) affiliation with the Kishu Ishido (紀州石堂) group. Further, Yasusada’s (安定) use of family name Tonda (冨田) that is identical with the name used by both Tameyasu (為康) and Yasuhiro (康廣) of the Kishu Ishido (紀州石堂) group adds to the probability that Yasusada (安定) was an artisan who once belonged to the Kishu Ishido School (紀州石堂). There is no doubt that Yasusada (安定) migrated to the Edo area. The presence of some of his works dating from the Keian era and signed Bushu-ni-Oite Kore wo Tsukuru (武州於作之), together with the fact that some of his swords bear Yamano Kaemon-no-jo Nagahisa cutting attestation, an Edo area cutting tester, show that he moved to Edo by the first year of the Keian era (1648). 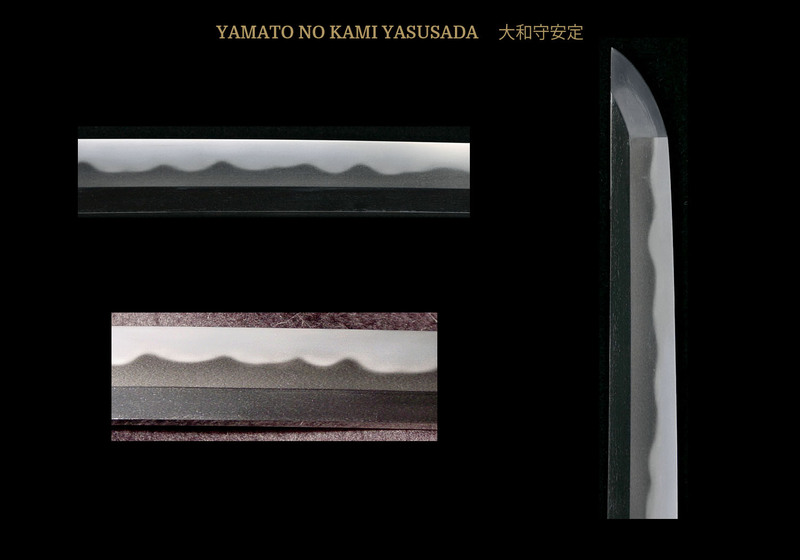 Many of Yasusada’s (安定) blades bear cutting tests by such prominent testers as Yamano Kauemon-no-jou Nagahisa and his blades have been given the title of ryo-wazamono meaning “very good cutting ability”. Yasusada’s (安定) blade characteristics, especially the long o-sujikai filed nakago with a markedly sloped ha-agari tip are quite similar to the works of Izumi (no) Kami Kaneshige (和泉守兼重). This has led scholars to the conclusion that Izumi (no) Kami Kaneshige (和泉守兼重) was a principal teacher of Yasusada. Further, since Izumi-no-Kami Kaneshige (和泉守兼重) is generally thought to have also been the teacher of Kotetsu (虎徹), it is probable that Yasusada (安定) may have had an influence on the early works of Kotetsu (虎徹). This is born out by the fact that his work has a good resemblance to the early work of Kotetsu (虎徹). In fact many of his blades are mistaken for Kotetsu (虎徹) in kantei. One of the major differences between the two, however, is the fact that Kotetsu’s (虎徹) blades usually have yakidashi and his hamon tends to widen around the yokote while Yasusada’s (安定) does not. SUGATA: Most of Yasusada’s (安定) works are katana and wakizashi done in shinogi-zukuri form. His katana are made in typical Kanbun Shinto shape with little sori and with a marked narrowing from the hamachi to the boshi. They are often longer than one usually finds blades made in this era. 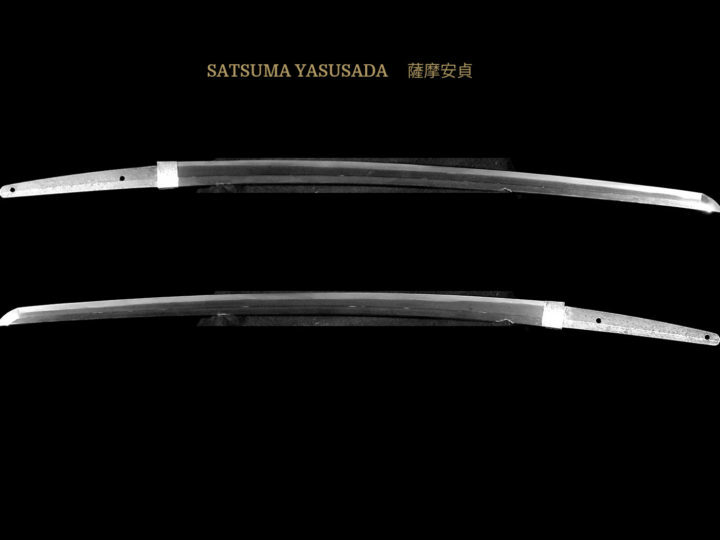 Another important characteristic of Yasusada’s (安定) sugata is the steep sloping angle of the bevels of the iori-mune of his blades. This is an important kantei characteristic. JITETSU: The grain of the steel is a fine ko-itame. There will be strong ji-nie sometimes appearing as ara-ji-nie. The shinogi-ji is masame further pointing to the fact that he was a smith from the Edo Shinto School. HAMON: His typical hamon will be a ko-midare mixed with gunome. Occasionally a suguha example will be found. Many will also have togari-ba in places. His hamon will have markedly varied widths throughout its length. The valleys and peaks of some of the gunome will have a straight to square characteristic. There will be ara-nie mixed with nie is places and ashi will be present. There will also be sunagashi embellishing the hamon and the overall nioiguchi will be somewhat faint. The gunome will not be as regular as that of Kotetsu and Kotetsu’s nioi-guchi will be much brighter. Another characteristic of Yasusada’s hamon is the marked narrowing of the midare just below the yokote. BÔSHI: Generally, ko-maru. A long kaeri will often be found. He is also known to have made blades with a jizo shaped bôshi. HORIMONO: Bo-hi (single grooves) are found. Other horimono sometimes found are ken-maki-ryu and bonji. MEI: With a few exceptions, some of which have been noted above, he usually signed his swords with the go-ji mei. The character “Sada” (定) has a unique formation in that the fifth stroke often stops in an upward sweeping motion. It was formed in the usual manner only in a limited number of examples made late in his life. 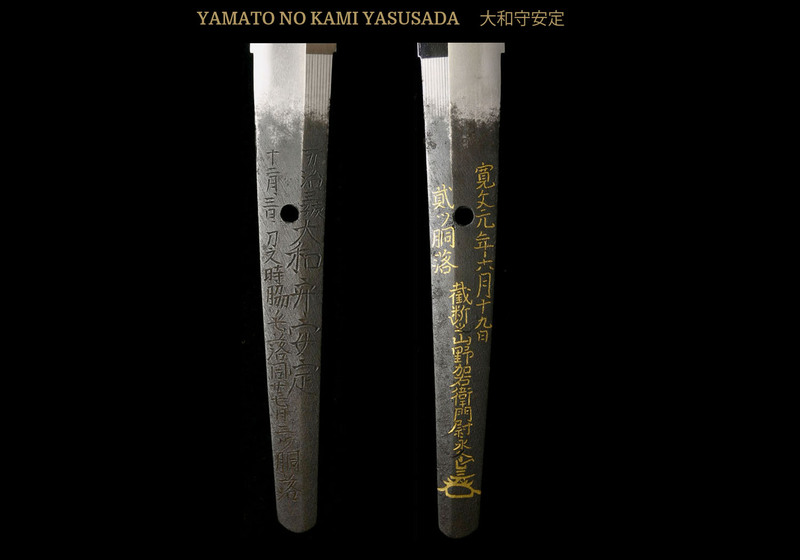 The above blade by Yasusada is very interesting because it has inscribed on its tang the results of three separate cutting tests. As I have mentioned, this smith’s blades often contain cuttings tests, but to have three separate tests done on one blade is truly unusual. The ura of the nakago has the following inscription done in gold inlay: Kanbun Gannen Rokugatsu Jukyu Nichi (寛文元年六月十九日) (June 19, 1661), Futatsu-Dou Otosu (貳ツ胴落) (cut through two bodies in one stroke), Saidan Yamano Kaemon-no-jou Nagahisa (kao) (裁断山野加右衛門永久) (“Cutter” Yamano Kauemon-no-jou Nagahisa (kao)). The omote of the blade has the following cutting test results. Above the sword maker’s signature is written Manji San Ne-Kanoe (萬治三子庚). This means the third year of Manji or 1660. Running the length of the nakago next to the maker’s mei is the following; Juni Gatsu San Nichi Kono Katana de Wakige o Otoshita Toki Dou Niju Nana Nichi Mitsu-Dou Otosu (十二月三日之刀時脇毛落同廿七日三ツ 胴落) On December 3, 1660 this sword made the Wakige cut (shoulder blades) and on the 27th day of that same month and year it cut through three bodies).